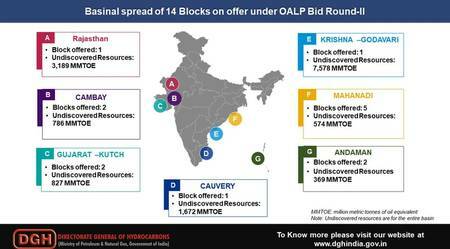 The blocks together hold undiscovered reserves of about 14,995 million tonnes of oil equivalent, according to a tweet from Directorate General of Hydrocarbon, India's upstream regulator. India, the world's third biggest oil importer, wants to unlock its vast hydrocarbon resources to cut dependence on foreign oil. India imports nearly three quarters of its energy requirement but Prime Minister Narendra Modi has set a target of cutting the country's fuel import dependency to two-thirds by 2022 and to half by 2030. India's previous licensing rounds have been dominated by local firms.